About a year ago I have escaped or so I thought,the war zone of Middle East only to find that terrorism doesn’t confine itself to one region anymore. 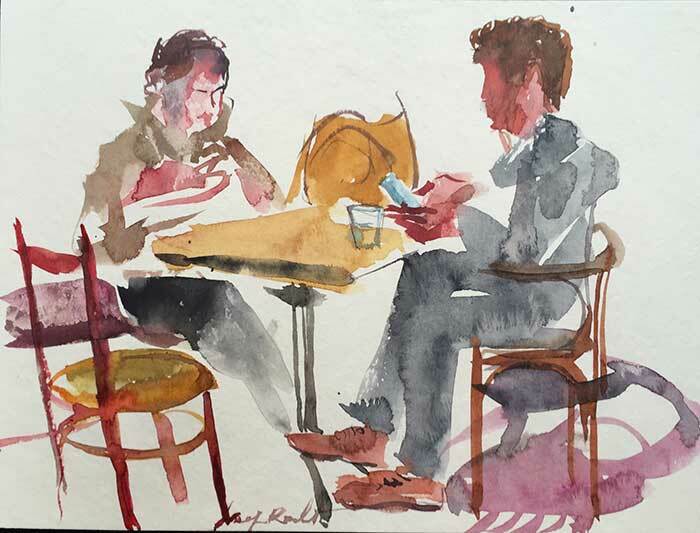 As I was sketching this French couple in the cozy atmosphere of my regular place, I had some thoughts on how creativity and art are influenced by hard times and wars. Maybe they came for the weekend to escape the aftershock of the Paris terror attack two weeks ago. The fact that cafes have become a target for terrorists attacks, gives my sketching in the cafes a sort of additional dimension of danger almost as being in a front line. I am joking of course but still, the fact that popular and crowded places have turned into a possible target all over the world, creates a heightened sense of tension adding a feel of urgency and danger to otherwise a very benign activity. My approach to working in cafes as a meeting ground for a diverse and sometimes absurd happening representing the fragmented World in which content got badly skewed out of it’s context got an additional boost from the fact that terrorists find the cafe a legitimate target for their violence. I find solace in the fact that many artist in the past have created their best work during times of extreme tension and war. One of such artists is Jan Vermeer of Delft who created his masterful works during one of the worst periods in Dutch history, following the Franco-Dutch war. 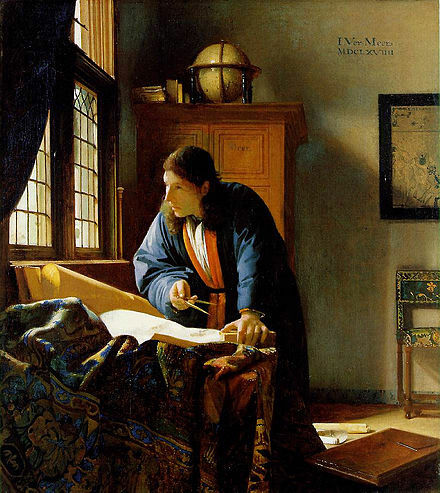 It is true that Vermeer was not oblivious to the suffering and destruction around him caused by extreme economic hardships and has died quite suddenly after a short illness but the fact remains that some of the greatest art was produced during such an extreme circumstances, gives some strength and hope that it is possible to create beauty even in the middle of chaos and hardship.